We at Minty Green Media are proud to announce the latest in Broadband Technology. Most consumers have at least heard of FTP (File Transfer Protocol). Some of the more well-versed of you are familiar with FTTP (Fiber To The Premises). Today we bring to you an all-new concept: FTTTP! To save others and myself some time, I'll pre-emptively answer some questions. 1. Yes, this is a joke. 2. Yes, that link light is on. The fiber is lit. 4. 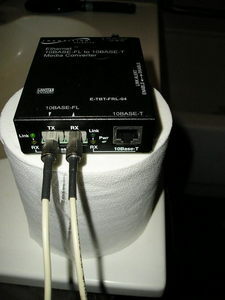 The joke only occurred to me after I put the transceiver down on the nearest open surface (i.e., a roll of TP).